The 300A might look like a grandpa mobile, but it is not a car to be taken lightly. The 300 in the name refers to the horsepower it is hiding under the hood. Don’t try to take this grandpa’s wallet. He will beat you down with his cane and leave you with dust in your mouth. The year was 1955, the era of American Muscle Cars had yet to arrive, so the 300A was designed with luxury in mind not a race through city streets with Steve McQueen at the wheel. The body design was a mashup of the New Yorker, Windsor and Imperial models. It came in three colors; black, white and red. And only 1,725 were built. As was often the case in this era the 300A was at its heart a response to NASCAR rules and regulations. The engine is a racing engine; a 331 cubic inch (5.4 L) FirePower HEMI V8 with twin 4-barrel carburetors and a performance exhaust system. The 300A was measured at 127.54 mph during the flying mile. Despite modest sales the car aroused a lot of interest from racing fans and big engine enthusiasts. Chrysler continued their “letter series” through 1965 ending with the 300L. 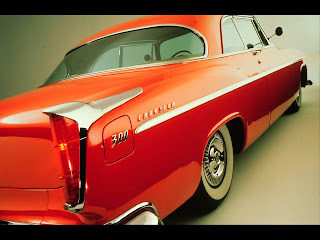 The 300A was a precursor to the muscle car era and for years this grand daddy of American muscle held the title of most powerful car produced in America. An old school dynamometer testing dynamo!